This model railway hobby of ours is really great. We develop such great friendships and plenty of skills by participating in this hobby. Dazza is one those guys that I have a great friendship with. I met Darren well over 20 years ago when I first joined the Railway Modellers' Club of Qld. We have been mates every since. I suppose it doesn't hurt that he models God's own railway - the NSWGR. Last Tuesday we had about 10 guys come over to the shed. The usual banter occurred. First things first the guys were checking up the new top deck. 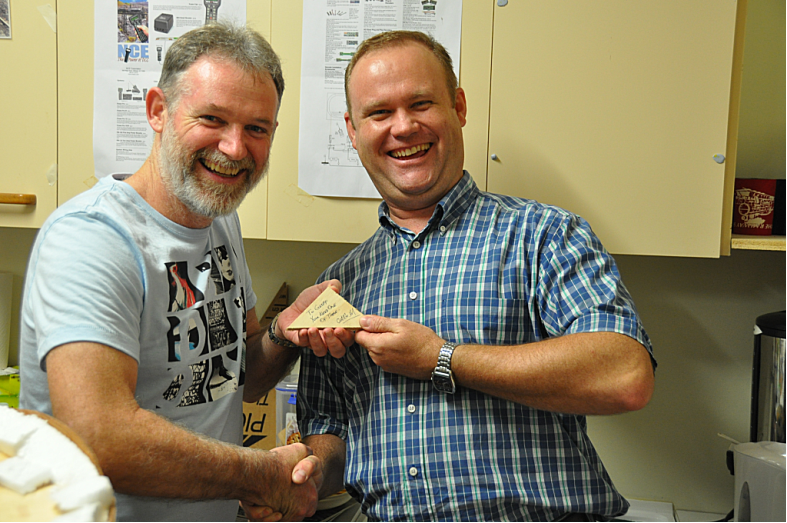 The next main event was when we presented Geoff with one of my paintented triangles. This bugger bagged me something chronic in last week's comment to my post. But it cracked me up. Both PK and I had the same idea about presenting Geoff with his own Triangle. So we presented Geoff with his very own triangle. That will teach him! Geoff seeing the funny side of the presentation. Photo by PK. Now to the topic of this post. Darren also had been working on my Train Control schematic on an old whiteboard. He offerred to work on this and over a number of month he quietly beavered away. Well he brought it over and presented it to me on Tuesday. It was brilliant. Ripper, Beaudy, Bonza! The overall view of the train control board. On the right of this board is my fridge and another place to extend the magnets for the location Grafton Yard. Here are a few closeups of various locations. Heading north of Cassino to the left. The red is where the branch at Old Cassino come in. Today I started cutting up some small magnetic strips that will be used by the Train Controller for the various trains. I also expect to have other magnets so he knows when certain wagons have been dropped off in the various sidings round the layout. I might also have to have something when a section of track is out of action so the Train Controller can put the section out of action. They will have train #, origin and destination and maybe what track it needs to go into on arrival at its destination. On Thursday I finally received my long awaited serial cable from overseas. It only took 7 weeks. All that for $3.99. I suppose I shouldn't complain. This will connect my NCE PowerPro to an old PC that I have put in the Train She. I will eventually get around to connecting them up and testing the JMRI connection. I was intending to go out to the Gabba on Friday afternoon to watch the Shield Final for a few hours, but I found it was streaming on the net, so I just came home and watched the motor racing on the TV and the cricket live on the tablet. Isn't technology grand? Yesterday I wired up the new control panel at Cassino and programmed the NCE mini panel using the default values of the point motors 1 through 4. I did not have my spreadsheet that has the actual numbers recorded in it with me, that I had previously allocated to these accessories. So I left the 4 points connected to the Digitrax DS64 at their default values. I was watching the F1 GP practice on the TV in the Shed, followed by the V8's racing and then I listened to the Cricket (Shield Final) at the Gabba on the Tablet and listening on the radio until rain intervened. This was followed by cleaning the track near where I had undertaken the last lot of scenery around The Risk. I then decided to investigate twisting a bit of wire together to see if I could make some tree armitures. I was trying to make some weeping willows for the Running Creek area. I made up 4 armitures but I still need to do some soldering, followed by application of 'No More Gaps' and then some paint. The trees will then be treated with white glue and have green scatter sprinkled on them, followed by bending up. I think I will need at least another 10 or so Weeping Willows for the banks of Running Creek. This will give the local naturalists some shade and protection from the local photographer (or should I say PK). Today I got down to the shed for another couple of hours and ran 6 trains (the empty cement, a loaded stock train, an empty ballast, a Down branch line container, the loaded paper train and an UP mainline container) from their current locations to their respective destinations. So now the timetable has again been reset back to its starting time. I then remembered that there were 5 wagons left behind at Old Cassino in the Dairy Siding during the previous running session that need to be put back into their starting train. I will fix up some issues with at least two train timetable sheets still directing trains back to the wrong starting tracks. But this is actually the first time that I have run all the trains through in a timetable fashion. So with Tuesday Night being a gathering of the crew at my place I thought I better put some photos up so the guys can see what I have done. You can see three levels of track in this photo. On the left (on the top deck) is Clapham Yard with the future track to the right heading towards Dutton Park. In the corner is where Loco Pilly will be situated. This shows the three decks with the track on the new top deck gaining height towards Dutton Park on the right. The top deck is currently held in place with wooden props. An overview showing the top deck heading towards the front of the layout (on the right) and the basic scenery cover around The Risk on the next level down. Still nothing on the bottom level at Cassino. This is where Dutton Park will be located. This will be where the mainline towards South Brisbane Interstate will branch to the right. Plenty of work to do before the baseboard and track extends further north towards Park Road Siding and South Brisbane gets built. Looking North towards Fisherman's Island. On the deck below a rail set train can be seen in a siding at Kyogle. This is where the Fisherman's Island terminus will be located. Look it already has it's first train. I am eagerly awaiting feedback from the guys about this further extension to the layout. Tuesday this was wet, but 9 visitors still turned up at Shelton’s place to see the progress on his Victorian based layout. As usual there was good company, good talk and a great night. And what about the fruit cake and mini lammingtons made by Deb - Just great. The only thing missing on Shelton's layout is some sound fitted locos - like a T or a Y class. Maybe for next visit. Shelton had started to install some very fine ballast, which had a few Tuesday Nighters asking about what brand was it, and he has installed some manual point operation rod that protrude through the facia. They work very well and look good. Old Mike brought along his On30 steam loco and we changed its address from #3 to #5. We even had Mike hauling some VR wagons around on the layout. We also made arrangements to meet at Horizon Hobbies early on Saturday and see what specials he had on offer. Saturday morning dawned and after dropping off a birthday present on the other side of town for the Boss’s girlfriend’s youngest daughter, I was travelling along South Pine Road when I looked at this beast of a red car in the right hand lane as I was coming up to a set of lights. OMG! There was this ugly person looking at me out the back passenger window and then it dawned on me that I knew that face and it was only Old Mike. It was Geoff being a chauffer in his new car for his car load of hoons (Mike, Darren and Brendan). It was fantastic timing. They then followed me to Horizon and we preceded to spend our hard earned savings on model railway items. I picked up a Tillig Dual gauge point and some scenery scatter. I was first to leave the hobby shop and headed back to the Clubrooms just a few kilometres down the road. I then started to investigate why Barry’s loco that I had just installed a decoder in (2 weeks before) would not work. I pulled it apart, and checked the lower motor connection that I had insulated from the frame. This was removed and then re-attached. I tested the motor separate from the loco and it worked. So I then reassembled the motor into the loco and Voila it was also now working. Did I ever tell you that I hate Athearn Locos almost as much as I hate old Hornby ones. Oh well I guess not everyone models God's own country of Australia and in particular the NSW North Coast area. Today I went over to Mike's place to discuss the finer points of decoder install. I had sent him an article that I had written and wanted to walk him through it to ensure that he understood it before he embarked on installing decoders into some of the mechanisms that he picked up the day before over at Horizon. Mike being the perenial scratchbuilder will build some On30 cabs to go over the motors, but he wants to run them on DCC. I think at our next Tuesday Nighters meeting we might see his locos built and ready for fine tuning of the CV's. Besides the above modelling related activity, I have not entered the shed for a week. I will have to take the vacuum cleaner to it next weekend as the next rendez vous of our group is at my place. This is when I unvail the next level of the layout to the group. My train activities this weekend was shot with family activities taking precedence. We had a ski-ing birthday party up at Lake Moogerah Dam first up on Saturday for Paige to attend, but we all went along - a nice 2 and a half plus hours round trip in the rain, followed by Kyle going on a play date at one of his mate's place in the afternoon and evening and the rest of us having dinner at a local Scottish restaurant. However, while Kyle was out, I was able to get down the shed for about and hour and a half. Sunday was supposed to be another lunch time Birthday party for Kyle to attend, followed by a family BBQ where I was to catch up with the family and in particular, a couple of my nieces who have just had baby boys in the last 4 weeks or so. However, with kids coughing up lungs and Paige then doing a bit more than that this morning, it turned out that I was the only one to go to the party this arvo. Didn't want to spread any germs to the real littlees. it is really great to catch up with my now only sister and all the nieces and nephews (and their better halves) and all their kids on my side of the family. Some real characters in that lot. So on Saturday I did something that have been looking at doing for some months but could not get motivated to tackle. I turned to some scenery and in particular, that area from the northern end of The Risk Loop to the tunnel portal south of The Risk (this was the area in front of the track) - a distance of about 6 and a half metres. I also did the area behind the track, which is quite mountainous from behind the Station building at The Risk to the same tunnel portal south of the Loop. This was about 2 and a half metres in length. Most of the area behind the track already had base covering of dirt on it while the area in front of the track mostly did not except for a section about 600mm long with I tile grouted for a base colour. So where I needed to I installed my dirt base, made up of a red soil and various shades of white and grey soils. This is wetted down with diluted white glue in squirt bottles with a touch of washing detergent. This was followed by the greening up of this whole area. Well it was really shades of yellow, yellowish brown, brownish green and some other shades of green. It certainly looks better than it was. Given the time available I did not have time for photos, and besides I want to surprise the Tuesday Nighters when they eventually get around to my place - who knows maybe in 2 weeks. then there will be pictures galore. I also installed the control panel that will control the four out of reach points in Cassino Yard. I still need to wire these control panel push buttons back to the NCE Mini Panel. This week we are off to Shelton's on Tuesday to see what progress he has been making. That is followed by Saturday at the Club if the kids are better - which after a week one would assume they will be.